Sophie Masson’s retelling of the Snow White mythology in Hunter’s Moon was one I longed to immerse myself in. It sat patiently ready for my holiday north and as soon as we left the freezing tarmac, I unsociably planted my nose in it (husband, kids - go entertain yourselves). I eagerly consumed the opulent then perilous tale of Bianca Dalmatin, heir to the Ladies Fair department store empire and stepdaughter to the beautiful but sinister Lady Belladonna. Presented into society at the Duke’s ball by her controlling stepmother, shy and lonely Bianca soon finds herself the subject of a murderous plot involving herself and her much loved father. The fleeting kindness of Belladonna’s faithful servant that spares Bianca, catapults her on a quest to find out the truth behind her father’s death and her stepmother’s treacherous plans. The mythical European inspired Faustine Empire creates scenes of rich architecture, tactile landscapes and mystical creatures. The majesty of the first few chapters illuminates a grand stage reminiscent of the late 1800’s, but then extremes of a sophisticated society and mystical backdrops, forced me to release my expectations and let the imagery unravel naturally. It is these extremities of setting that force young Bianca out of her protected life to find the inner strength to navigate betrayal and look beyond her upbringing to learn the true sense of trust, loyalty, sacrifice, determination, family and self. Uncovering the references to the well-told Snow White tale was an entertaining addition to the reading experience. The huntsman, magic mirror, poisoned apple, glass coffin and seven dwarfs have all been cleverly intertwined through the story in unexpected ways that will give the younger reader a spark with each discovery. 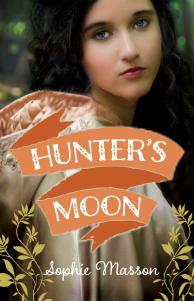 Hunter’s Moon has all the appeal of romance, action, magic and a fabulous frock or two which has been brilliantly constructed to not overwhelm or confuse readers in the early teens. It is the fourth book in the series by Masson that retells famous fables. Moonlight and Ashes, Scarlet in the Snow and The Crystal Heart, take the skeletons of Beauty and the Beast, Cinderella and Sleeping Beauty to a new and wondrous level. The trick is to work out which one is which?